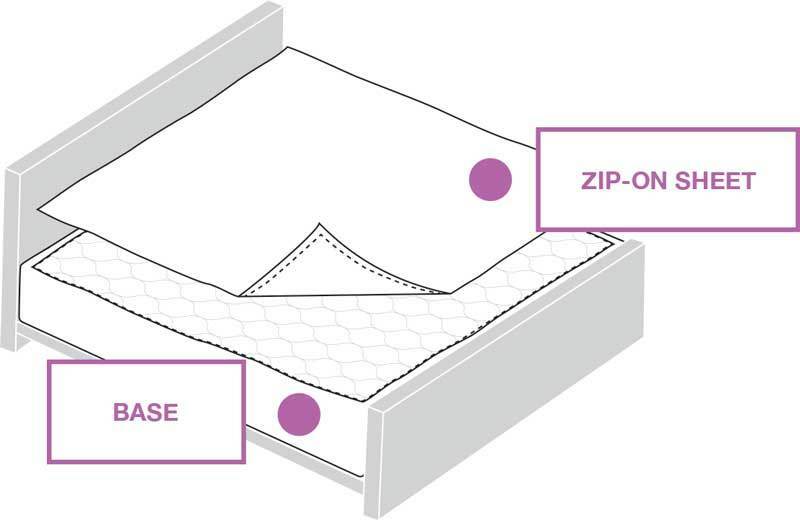 QuickZip has reinvented the fitted sheet. Bed sheets come in two main varieties: flat and fitted. A flat sheet is simply a rectangular sheet of cloth, while a fitted sheet has its four corners, and sometimes two or four sides, fitted with elastic, to be used only as a bottom sheet. The fitted sheet may also be secured using a drawstring instead of elastic. The purpose of a fitted bottom sheet is to keep it from slipping off the mattress while the bed is in use. 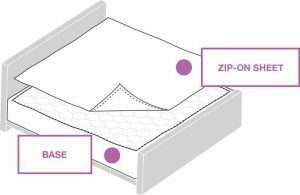 A particular way of folding and tucking while making the bed, known as “hospital corners,” is sometimes used when the bottom sheet is flat rather than fitted. The genius crib and fitted sheets that zip-on in seconds. The base stays on; the top sheet zips on and off in seconds. The Perfect Rug, where you can design custom area rugs online for indoors and outdoors in 3 easy steps. They call it custom rugs at un-custom prices. Choose your rug material, size and border. Design your own custom area rug online from hundreds of top quality rug materials in any size and shape. Accent Rugs and patterned rugs can be made to coordinate with larger area rugs, and, hallway runners can be made to match a round entry hall rug, giving you that designer area rug look. They stock plenty of shag rugs, plus berber, plush, woven and wool rugs. So, whether you are looking for a round sisal rug or a looped pile in bright orange, you can make it here. Whatever the need, whatever the size, they can make custom made rugs for you at The Perfect Rug. Your size, your style. Perfect. Wedgwood has a heritage of over 250 years of producing products that exuberate excellence and quality. This iconic brand remains a leading brand on the world stage for tableware and home lifestyle through a portfolio second to none. Products range from formal luxury through to premium casual collections. Key designer collaborations include Vera Wang and Jasper Conran. Josiah Wedgwood and Sons, commonly known as Wedgwood, is a fine china, porcelain, and luxury accessories company founded on 1 May 1759 by Josiah Wedgwood. In 1987, Wedgwood merged with Waterford Crystal to create Waterford Wedgwood, an Ireland-based luxury brands group. Waterford Wedgwood was purchased by the New York City-based private equity firm KPS Capital Partners in 2009, and became part of a group of companies known as WWRD Holdings Ltd., an acronym for “Waterford Wedgwood Royal Doulton.” On 2 July 2015, Fiskars Corporation acquired WWRD. At the outset, Josiah Wedgwood worked with the established potter Thomas Whieldon until 1759 when relatives leased him the Ivy House in Burslem, Stoke-on-Trent, allowing him to start his own pottery business. The launch of the new venture, his own company, was helped by his marriage to Sarah Wedgwood, a remotely-related cousin, who brought a sizable dowry to the marriage. In 1765, Wedgwood created a new form of earthenware, which impressed the then British Queen consort Charlotte of Mecklenburg-Strelitz who gave official permission to call it “Queen’s Ware.” This new form sold extremely well across Europe. The following year in 1766 Wedgwood bought Etruria, a large Staffordshire estate, as both a home and factory site. Wedgwood developed a number of further industrial innovations for his company, notably a way of measuring kiln temperatures accurately and the new ware types Black Basalt and Jasper Ware. Wedgwood’s best known product is jasperware created to look like ancient cameo glass. It was inspired by the Portland Vase, a Roman vessel which is now a museum piece. The first jasperware color was Portland Blue, an innovation that required experiments with more than 3,000 samples. In recognition of the importance of his pyrometric beads (pyrometer), Josiah Wedgwood was elected a member of the Royal Society in 1783. The Wedgwood Prestige collection sold replicas of the original designs as well as modern neo-classical style jasperware. The main Wedgwood motifs in jasperware, as well–as in other wares like basaltware, queensware, caneware, etc.–were decorative designs that were highly influenced by the ancient cultures being studied and rediscovered at that time, especially as Great Britain was expanding her empire. Many motifs were taken from ancient mythologies: Roman, Greek and Egyptian. Meanwhile, archaeological fever caught the imagination of many artists. Nothing could have been more suitable to satisfy this huge business demand than to produce replicas of ancient artefacts. Many representations of royalty, nobles and statesmen in silhouette were created, as well as political symbols. These were often set in jewellery, as well as in architectural features like fireplace mantels, mouldings and furniture. Wedgwood has honoured American individuals and corporations as well, both historically and recently. In 1774 he employed the then 19-year-old John Flaxman as an artist, who would work for the next 12 years mostly for Wedgwood. The “Dancing Hours” may be his most well known design. Other artists known to have worked for Wedgwood include among others Lady Elizabeth Templetown, George Stubbs, Emma Crewe and Lady Diana Beauclerk. Wedgwood had increasing success with hard paste porcelain which attempted to imitate the whiteness of tea-ware imported from China, an extremely popular product amongst high society. High transport costs and the demanding journey from the Far East meant that the supply of chinaware could not keep up with increasingly high demand. Towards the end of the 18th century other Staffordshire manufacturers introduced bone china as an alternative to translucent and delicate Chinese porcelain. In 1812 Wedgwood produced their own bone china which, though not a commercial success at first eventually became an important part of an extremely profitable business. Josiah Wedgwood was also a patriarch of the Darwin–Wedgwood family. Many of his descendants were closely involved in the management of the company down to the time of the merger with the Waterford Company. TotalProtect Home Warranty plans can cover multiple appliances (refrigerator, oven/range, cooktop/stove) and systems (HVAC, plumbing, electrical), no matter the age, make or model. Save money on unexpected repair and replacement costs with TotalProtect Home Warranty plans as low as $21.95 per month (pricing varies by plan and state). Plus, they offer flexible pricing and deductible options to help homeowners find a plan that meets their needs and budget. TotalProtect is part of the Cross Country Home Services, Inc. (CCHS) family of brands, rated as an ‘A’ Business with the BBB and earning 4.6 out of 5 stars on ConsumerAffairs.com. TotalProtect has more than 40,000 highly qualified and pre-screened service providers and stands behind the workmanship of their service partners with an industry-leading 180-Day Wormkanship Guarantee, making home ownership easier and worry free. MyNuWaveOven.com is the official website for the NuWave Pro infrared oven, winner of the American Culinary ChefsBest’s prestigious Golf Medal Award for “Best Performance” 8 years in a row. The NuWave Oven can broil, roast, grill, bake, steam, barbeque, dehydrate, even air-fry and all without added fats or oils. Independent third party tests have proven that the NuWave Oven cooks up to 50% faster, uses up to 85% less energy, when compared to a regular conventional oven, and also produces up to 250% more fat drippings from meat and poultry helping to support your diet and health living. Mess Free Cooking With The NuWave PIC! Hearthware, Inc. produces the NuWave Pro Infrared Oven, a countertop oven that combines infrared, convection, and conduction heat to cook food. Purchase a NuWave Oven for $119 and get one free! Hearthware, Inc., also known as NuWave LLC, is an American manufacturing company that focuses on products for healthy living including kitchen appliances, sporting goods and safety gear. The company was founded by Jay S. Moon in 1997. Moon first came to the United States from Korea in 1987 and served as a product manager for LG Electronics, formerly Goldstar Co.Ltd. He began his first solo venture in 1993 when he launched IBC USA Incorporated, which supplies components to OEM household appliance manufacturers. Later, he founded Hearthware Home Products Inc.
Order a NuWave Cooktop and get $200 in gifts… FREE! Air-n-Water.com offers unique, hard to find products, along with fanatical customer service and great prices. They carry a wide variety of Appliances, Heaters, Air Conditioners, Vacuum Cleaners, Ice Makers, Wine and Beverage Coolers, Refrigerators, Humidifiers/Dehumidifiers, Thermostats and More! Click on the Image to Find it and more. Click on the Link to Find it and more. Take $20 off Most orders $200+ with promo code SAVE20 at Air-n-water.com! The Vapor-Eze 1070 vaporizer and aromatherapy unit uses 100% natural oils and is so safe it can be used by newborns and senior citizens. Benefit from instant cooling with the MovinCool Classic10 10,000 BTU portable air conditioner. This portable AC has the power to keep you comfortably cool! Heat up small rooms quickly with the uniquely designed Honeywell HZ-0360 360 degree mini tower space heater! The Avanti WD360 water dispenser offers a lightweight, durable plastic body making the unit easy to clean and transport! With its sleek design and high-tech capabilities the Crystal Quest CQE-WC-00904 Elegant Ultra Filtration water dispenser will modernize any home or office. Enjoy a romantic outdoor outing for two with the lovely Picnic Time 122-15-515 Vino wine and cheese picnic gift basket that is sure to impress anyone. Experience tea like never before with the Teaposy TP-BUD-ASSORTED single assorted tea ball, which gently unfolds and blossoms into a beautiful flower! Eradicate harmful airborne impurities with the Clarifier-Medical NQ Industries air purifier. Superior filtration makes this great for medical facilities! The SR-WHM Perma-Seal is a white shower water filter with massaging showerhead, sure to refresh your budy and mind for one whole year. Is it time to change your air purifier filter? Make it easy with the complete set of Vapor-Eze 5000-RF Clean Air replacement filters. Made with activated carbon material and antibacterial coating, the FilterStream AF-1620AM is especially designed to eliminate germs, odors and viruses. The FilterStream ACL-100 aroma system comes with two individually wrapped aroma cartridges for a two month supply of relaxing lavender scent. By using the Honeywell TH8110U1003 VisionPRO universal programmable thermostat you can save up to 33% on annual heating and cooling costs! To keep your Amaircare Roomaid air purifier in perfect working order you’ll need this standard replacement filter kit. Powerful and durable the Soleus FF1-50-53 high velocity floor fan is great to keep your home or business cool. If space and functionality is important to you the SF-0702 is the perfect fan for you! Perfect for commuters or even one-coffee-drinker households, the Medelco KF111 makes one cup of fresh coffee every time. The Medelco EXP100 One All 4 cup espresso carafe features high quality borosilicate glass construction for long-lasting use. Enjoy coffee in the best possible way with the Brasilia Portofino Executive 3 group automatic espresso machine. Making the perfect espresso is easy! Keep the air you breathe clean with the Blueair 200 series air purifier replacement filter. A new filter keeps this air purifier in good working condition. Compact Appliance is an Internet Retailer Top 500 site and was created to provide an online destination for people in search of distinctive home appliances that offer maximum functionality in a minimal amount of space. They pride themselves in delivering excellent customer care and unique products at a fair price. They carry a comprehensive selection of appliances for small spaces that are perfect for use in R/Vs, Boats, Dorm rooms and more! They carry a huge selection of: Air Conditioners, Ice Makers, Wine and Beverage Coolers, Refrigerators, 12 Volt Coolers, Heaters, Humidifiers/Dehumidifiers, Washers and Dryers, Dishwashers, Microwaves, Ovens, Hot Water Heaters, BBQ Grills, Generators and Much More! Go Vacuum is a leader in online vacuum cleaner and air purifier sales. Go Vacuum is a premier site that you can shop and recommend with confidence. They offer thousands of top rate products and services that are sure to please even the most discriminating visitors. WonderGel offers a line of gel seat cushions and other comfort products to bring comfort to every sitting situation. Try WonderGel at home, in the office, on the road, at church, at the game, on the plane, as a kneeling pad, and any place you need comfort!